Universal size WATERPROOF CASE bag fits all smartphones up to 5.7" diagonal. 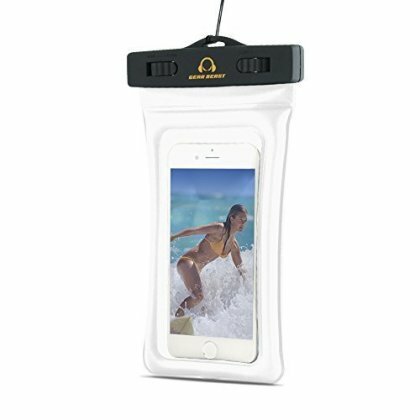 Keep your phone, along with your ID, credit cards, wallet, money or other personal items dry and clean in this waterproof dry bag perfect for the pool, beach, fishing, skiing, waterpark or anywhere else where you want to keep your phone from getting damaged by water or other elements. Innovative AIR FLOAT design keeps the waterproof case, and its contents, floating on top of the water. The perfect solution for boating, waterskiing, fishing or any other activity where your case could be dropped in water. Case bag constructed of CRYSTAL CLEAR WATERPROOF TPU material that is stronger and more tear resistant than other plastic waterproof bags and allows full touch screen access so that you can check emails, texts or surf the web. Also, the clear front and back allows you to take pictures and videos without removing your phone from the waterproof case. IPX8 CERTFIED WATERPROOF to 10 feet; Secure seal provides protection from water, dirt, sand, snow, grease and other elements that could damage your phone. Compatible with protective cases like Otterbox. Lifeproof, SUPCASE and Urban Armor on most phones (phones with displays larger than 5.3 inches may need to remove protective case to fit). Compatible with the latest devices including iPhone 6s, iPhone 6s plus, iPhone 6, 6 Plus, 5, 4, Galaxy Note 5, 4, 3, 2, edge, S7, S7 edge, S6, S6 edge, S6 edge plus, HTC One M8, M9, Motorola Moto G, Moto E, Moto X, Droid Maxx, Droid Turbo, Moto X Pure, Droid Maxx 2, Droid Turbo 2, HTC Desire, Nokia Lumia. Windows Phone, Moto X, Nexus 5, Sony Xperia Z3, Z2, Z1, Honor 6, OnePlus 2, LG G3, G4, and many other phones and electronic devices.